Institute's Gareth Brown fired home the winner in the first half. Institute produced another tremendous away day win, this time at leaders Knockbreda. Gareth Brown’s wonder strike early on was enough for Paddy McLaughlin’s men to move into just a point behind new table toppers Ballyclare Comrades. Once again Caoimhin Bonner and Dean Curry in particular at the heart of the ’Stute back-line were super, while keeper Marty Gallagher secured another clean-sheet. The vistiors started on the front foot and they deservedly took the lead in outstanding fashion on four minutes. Striker Brown picked the ball up some 20 yards from goal and his fantastic left footed strike, flew past a diving Knockbreda keeper David Ferguson, into the top corner. Knockbreda skipper William McBurney was getting more frustrated in the early stages and deservedly picked up a caution after fouling Aaron Harkin. 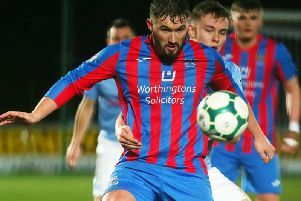 Institute went close to adding a second on 23 minutes as Niall Grace saw his long range, strike flash just over the bar. Minutes later Grace should have scored as Eamonn Seydak’s teasing left wing centre found the skipper, but his close range header failed to trouble Ferguson and whistled just past his right hand post. Just before the break ’Breada had a great chance to level things but centre-back Ryan Arthur’s close range downward header was well saved by ’Stute’s Gallagher. The Drumahoe side were inches away from adding a second on 49 minutes as Brown fed Stephen Curry, he rounded Ferguson, before seeing his left foot strike towards the net, but Kris Pike got back to clear off the line. Just before the hour mark another Curry break down the left ended with his centre finding Ryan Morrow, but the full-back blasted over. On 61 minutes Ciaran Murray saw his well hit 30 yard free-kick kept out by a diving Gallagher. The home side continued to pile on the pressure and moments later another long throw-in by Murray caused an almighty goalmouth scramble, which Gallagher showed great bravery to eventually grab a hold of the loose ball on his goal line. In the closing stages and with the home side pumping high balls into the box, ’Stute went close on the counter attack to scoring what would have ended the game as a contest. Substitute Jake Morrow broke clear down the left before he played a super pass to fellow sub Ronan Wilson, who after getting in behind the ’Breada defence, blasted well over. Knockbreda: Ferguson, Culbert (Ryan 71), Pike, Patterson, Arthur, Hamill, McBurney (Walls 85), Cooling, Cafolla (Halliday 65), Murray, Cockcroft. Institute: Gallagher, R Morrow, Bonner, D Curry, Seydak; C McCallion, Grace, Harkin; S Curry (Wilson 71), Brown (Friel-Curran 75), Dunne (J Morrow 85).